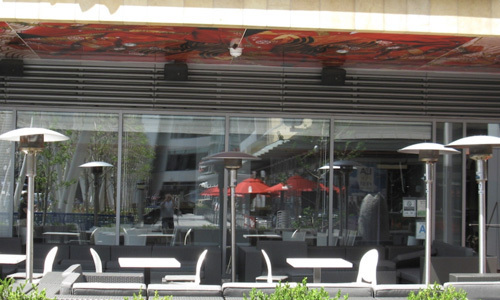 Outdoor patios provide a significant commercial and lifestyle enhancement that comes at some cost. That’s why it makes sense include just the right heater to get the full benefit of your outdoor living space. Homeowners make the investment into patios because they can improve quality of life and earn an uptick in real estate value. People with a passion for the outdoors often add accessories such as grills, refrigerators even full outdoor kitchens. In commercial settings such as restaurants and resorts, these leisure spaces can expand seating capacity while providing patrons with a next-level atmosphere. The bottom line is that many people embrace the fresh air and clear skies whenever possible. But all this investment into an outdoor patio would be incomplete without a way to stay warm. That’s why the high-quality outdoor space heaters from AEI can put the finishing touch on your residential or commercial patio. It may come as some surprise, but outdoor propane patio heaters extend the season in just about every part of the country. People living in Northern states tend to think they are the ones impacted by season change. It’s true that far-north states have shorter warm-weather seasons. Outdoor heaters such as AEI’s Patio Comfort model can help comfortably extend the season deep into autumn. If you are fortunate enough to catch a warm spell, a few well-placed portable heaters might allow you to have Thanksgiving dinner on that patio while enjoying the foliage. But Southern states are also impacted by cool weather. In 2017, Florida experienced below-freezing temperatures. Another important item some overlook is that people grow accustomed to seasonably high temperatures and dips of just 10 degrees can clear out a restaurant’s outdoor seating. Business owners with a knack for driving solid revue year-round invest in AEI’s Sunpak commercial model among others. This infrared-driven outdoor heater technology has been an industry standard for upwards of 50 years. What smart business owners have long known is that acquiring the items that reinforce a comfortable outdoor environment doesn’t just make sense, they make dollars. Whether customers live in the North or South, everyone feels the chill at some point. Extending the outdoor seasons improves quality of life and business profits. One of the common misconceptions that hold people back from including a heater on their outdoor patio is the notion they are unsafe. Whether that idea involves a customer getting burned or an unsupervised child touching a hot metal element, nothing could be further from the truth. In fact, AEI products utilize a blend of infrared and self-contained heat sources that are widely used by homeowners, resorts and small businesses around the world. Among the most popular unit is the Sunglo model. These products enjoy the flexibility to use natural gas or propane. The Sunglo line also includes the standalone units commonly seen on the patios of outdoor restaurants. However, the line also offers a fixed, overhead model that helps free up floor space. Homeowners with the capacity to hang heaters often adopt this option as well. One of the higher-end products that has enjoyed significant popularity is the Infratech model. The design has been sought after because its infrared technology provides 90 percent energy efficiency. That’s a high rate for any type of heating system. This model also offers excellent décor-matching abilities and blends seamlessly into most outdoor patios. Beyond its aesthetically pleasing design and energy efficiency, it also ranks among the safest options for an outdoor patio. Infrared heat provides a relaxing warmth. It also doesn’t introduce open flame into a commercial or residential patio. This reality provides heightened safety for any outdoor living space. Not only does an Infratech model keep friends, loved ones and customers cozy, it also takes any perceived worry out of investing in an outdoor patio heater. When you consider the amount of money you put into your outdoor patio, it’s important to recoup the value. Enjoying this space for short summers in the North or nixing the winter months in the South simply doesn’t make sense. That is, when you consider AEI’s cost-effective line of high-quality outdoor patio heaters. For business owners, the customer traffic can far outweigh any upfront cost and gas heat tends to be much less expensive than electricity. Homeowners with patios have already made the decision to spend money on their leisure time. For a few dollars more, you can extend outdoor living for months.